The Tweed Run. What fun! Sorry about the coding, I think I fixed it. While many name the mortgage and credit-default-swap crises as culprits, they are only the most recent results of an economy with fatal design flaws. These design defects range from a dependence on growth, consumerism, and the structure of money to the short-term focus of today’s markets, and policy goals that are focused on growing Gross National Product and cost externalization. These systemic flaws create economic injustice, poverty, and irreversible environmental devastation. It doesn’t have to be this way. The green economy offers solutions that are the antidote to the current breakdown. Green America members have been trailblazers for green economic solutions for years. We now have a teachable moment to be bold in stepping up with these solutions for long-term change toward sustainability—and helping people through tough times. Green economy solutions are more important than ever. Simply put, we need to move from greed to green. Continue reading here: 7 Fixes from the Green Economy. 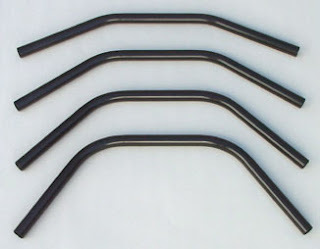 Three widths, four bends, 12 bars: $35. And these doods will reem the ends for an extra $10. I know, they're officially for tandems. Get over it. No jokes about reeming the ends please. 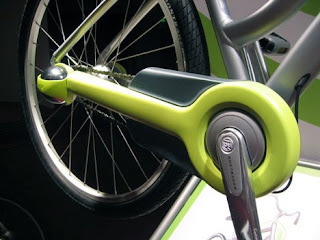 This is chainguard on the 2009 Lime series bikes, from the big T. This particular chainguard is also lime-colored, but the brightly colored portion is actually a removable applique (as are the lime-colored parts of the hub-covers and some other bits). Trek calls these large rubber bands Peelz(TM), and you can buy sets in a variety of colors. Presumably matching Trek's 2009 "casual cycling" clothing line and helmets. Here's a shot of a whole Peelz Color Kit, in my favorite color. 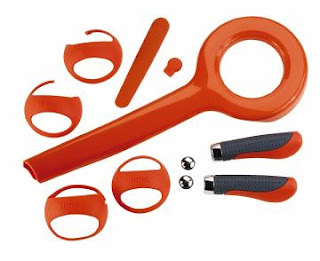 The two hard-to-identify items are a "top tube pad [and] seatpost collar QR grip." I know it sounds like I'm mocking this feature, but actually I like it. 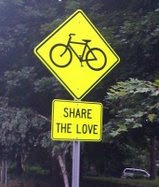 If it gets someone on a bike, then it's got something going for it. Now, there are real issues brushing up against Shimano's Coasting concept. They'll get a post of their own, I think. 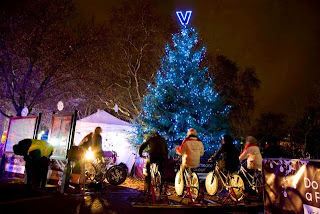 BicycleDesign.Blogspot.com is worth reading. It's written by an amateur bicycle designer (but a professional other-stuff designer) who watches the industry, finds lots of interesting and fun things, and writes about them.